Shine the Divine: Creativity IS a Spiritual Practice: Getting to Know ME again. Getting to Know ME again. Who am I now? That is the question that rises again and again in my consciousness. Mostly, on the inside, I'm still the me I've always been. On the outside, at first glance I look the same...a bit thinner than I was in the summer, but hopefully my appetite will pick up again. My sense of humor, my favorite colors, foods, music, poets, works of art, books all have remained the same. But my body does not move the way it used to 7 weeks ago. My voice shifts to one that is not at all familiar to me through out the day, depending on how fatigued I am. And my energy level is about the lowest it's ever been. I am not depressed. Yet I am certainly grieving. I know this is normal, healthy; to be expected. I've been dealing with illness for the past 10 years...but this feels different than any of the other times. My girls needed some new clothes and wanted me to join them for a typical shopping trip with their Mom. Our friends offered to take the girls without me...or with me if I felt up to it. This would mean using my cane for as long as I could manage and my wheelchair in public for the first time (aside from doctor's appointments, pt and our trip to the art museum far from home the day Rosie had her pill-cam endoscopy). I had a choice. I could stay home and miss this outing with my girls and friends; temporarily turning away from the fear of what it would be like to be ''seen by others" as disabled (and more to the point seeing myself as disabled). Or I could begin the next part of this healing journey and accept that at least for now, I can't walk very far without the assistance of my cane and when I really run out of steam (which doesn't take long), my wheelchair. I admitted to Belin (my nearly 16 year old daughter) that I was feeling anxious and perhaps a bit agoraphobic...and she wisely counseled: "Mom, when I'm feeling that way, your advice to me is always 'face your fears...and I (meaning ME) will be with you'. Mom, Rosie and I will be with you. It will be ok. We want you to come." My daughters needed me. They needed a normal activity with me, their mother...and for now, Mom cruising around the mall in a wheelchair is our normal. If my pre-teen and teen aged daughters were not ashamed to be seen with me this way....why was I feeling embarrassed about my current physical condition? I would certainly never judge another human being unkindly because they moved, sounded, behaved or otherwise apeared "differently-abled" from the "norm". What about all that compassion toward my body I'd been practicing in meditation? This was my opportunity to truly take it off my meditation cushion and into real life. The photo above is a self-portrait I took before we left. You can see the uncertainty in my eyes, and perhaps a hint of determination. Well....we did it. I started with the cane at the first store. We found a bench when my voice started to shift and my legs cramped up and my balance was getting less than stable. I hung in there. We went out for lunch, something I haven't done in 7 weeks. We drove on to the mall and took the wheelchair out of the car. when we arrived. And there I was...at the mall, with my girls, my friends and lots and lots of people, maneurvering my way between crowds and clothes racks. And yes, I was exhausted by the end, but I had FUN! I was ME...I am still ME. Perhaps my strength, coordination, balance, energy level and voice will return to the way they were before this latest exacerbation struck 7 weeks ago. My vision is certainly close to what it was before. Maybe just some of those physical symptoms will go away. Or perhaps, this is how it's going to be. I've said it before on this blog, and anyone living with MS knows, this is a mysterious disease. As changeable and unpredictable as the weather in New Hampshire. Like the variable winds and temperature, I must begin to shift my attitude from what I have understood normal to be for my body in the past and love my body as it is, moment to moment. This is a process we all must face as we age...but for me the transitions are more abrupt and coming earlier than expected. If I can learn to accept each change as it occurs, I will find peace in knowing that no matter how I sound, look, move...I'm still going to be ME on the inside...and as long as I can do that, everyone else will see me too. I feel content in knowing that revisioning what it means to live in my altered body with courage, compassion and dignity is actualizing the original intention of this blog "Creativity as a Spiritual Practice", in a way I never imagined! Imperfection is truly an opening to worlds of possibility. It is surely a doorway to creativity that unfolds as a spiritual practice. hi Laura this was so nice to read, you express yourself beautifully. So glad that you decided to go for it and enjoyed a fun day. i think that acceptance opens up a space for healing to take place on a much deeper level. Oh laura... yes the determination shows, no wonder your girls are so proud to be out with you. It's lovely when they come out with things that confirm we've done alright in their up-bringing isnt it? Face the fear & do it anyway eh? Even if you hadn't used the cane to begin with & utilised the wheelchair straightaway, it's not 'giving in' to your condition... it's adapting to present circumstance... a perfect example of living in the present moment, lol. I've been participating in a blog book group. We are reading the "Joy Diet" by Martha Beck. This week we are reading about taking risks. I've been thinking about the risks that I've taken in just this last year. Look at all of the fears that I have faced and how stronger I am because of it. Now things that I perceived as risky seem less so. I'm so happy to read that you took the risk to go out with your daughters. You are taking risks too by sharing your journey, posting self-portraits. When I look at your photo I see a strong and beautiful woman. This is the first photo that I've seen when I can really so those dazzling eyes. I hope you'll take more self-portraits in the months and years to come. Keep looking forward! Thank you all for your thought-full and heart-full comments. I think blogging in general is a risk...as is any creative act, because we are allowing our vulnerabilities to be completely exposed...but love is a risk, living each day is a risk. Sometimes we are just more aware of that fact than at other times. It depends on how present we are whether or not we notice, I guess. Who are you? A beautiful spiritual being.. Courageously embracing the moment! I have found when I take my mom out in her wheelchair, that there are so many compassionate people in the world, always willing to be patient. We are all on this journey together, thank you for sharing yours. I feel so blessed, supported and encouraged by so many compassionate responses to this blog entry. The world is filled with kind, loving beings. Fear blocks us from seeing that in others and in ourselves as well. Laura! Thank you for your inspiring words! I feel so blessed to have met you, as we have over the Internet today! Blessings to you! Eat up! As a newcomer, I wasn't aware of the MS. 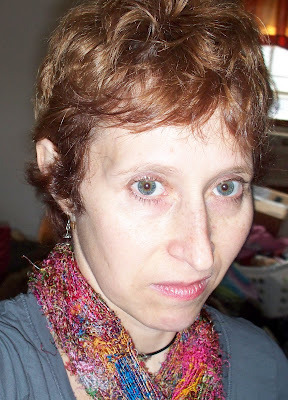 Your photo shows uncertainty in the eyes ... but then you put on that brightly colored scarf, reaffirming that you know exactly who you are - as Doe Grozs Art said, a Beautiful Spiritual Being. It takes beauty, grace and strength to deal with the human vessel's limitations and challenges. One of my favorite yoga teachers used to say "Receive what you are given." To me, it means to accept where you are and what you're dealt as part of the journey. I am completely thrilled that you went, you listened to your body and adapted as needed and that you had FUN! Your girls learned from a very wise mother. Thanks Rose...I like that..."receive what you are given"... sometimes we are too caught up in the disappointment of our expectations not being met to really see and fully receive the blessings we have been given. What a heart touching post. Such good teaching for us all. Such courage! I am happy to post a link to your site. I will do that later today. Many blessings to you.